Together, we improve people’s everyday lives and well-being. We go out of our way to treat each other and our customers with care and respect. We’re honest and fair in everything we do. We love working together as a family. We’re better together than we could ever be on our own. We take every chance to make ourselves and our Company great. We take smart risks, create our own change and welcome new challenges. We root out waste, work together and push ourselves to win. We know that growing our Company means winning store by store, week by week. We want everyone to live a healthy, balanced life. We want all Team Members to have the freedom to be themselves and feel respected, cared for, supported and safe. 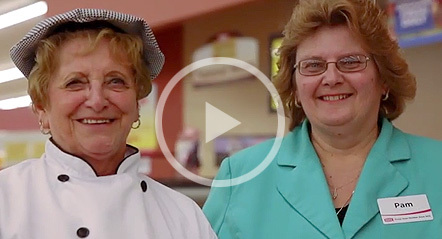 Hear from Pam as she talks about her career with Giant Eagle and why she is proud to have been part of our world-class retail family for 39 years. Hi. My name is Pam and I’m a proud 39-year Team Member. At Giant Eagle you couldn’t ask for a better place to be. I think we are a world-class company. I think we are the best of the best. And I don’t feel anybody would regret coming in through those front doors to work with us. We welcome our new Team Members and you always have to be there for each other. We’re a family oriented company and I love the fact that we can talk to our fellow team members as if they’re part of our family. We can go to our leadership at any given time. We could go to one of our Team Members and we can vent. We could say how we feel, its the real deal and we’re not going to be judged by it. So I just absolutely love the fact that we’re a family oriented company. If it wasn’t for my customers, I wouldn’t be needed. If my customers don’t walk through that front door, then they don’t need us there. It’s just they’re our family. They are not just our customers and we know our customers by name. They know us by name and it’s really funny what our customers come in and tell us. We know probably a lot about their families. We all come from the same walk of life and we work hard. But we are individuals. Caring individuals and that’s what we’re all about. As a company that’s what Giant Eagle is about. We just really enjoy working together.